1)Comment on this blog post telling me which MamaSteph’s cookies are your favorite, or which you would like to try if you don’t have a favorite yet. That’s it! 2)Bonus entry will be given to anyone who subscribes to my blog; you’ll see on the right sidebar a button that says “email subscription.” Fill in your email address and click “sign me up!”; that’s it! I’ll see it and will add another entry for you. I totally appreciate all of you who read my blog and who are Facebook fans of MamaSteph’s Cookies. You make my day, every day! Make mine molasses cookies, please!!! 🙂 Oh, wait, are family members excluded? i wanna try the ginger ones! Ok…I am not picky because am pretty sure you don’t make any bad cookies!!! Any cookie with cocolate is fantasic, mmm, let me think about this…ALL COOKIES ARE GOOD!!! Or – oh, just surprise me! I’m so glad to be a little part of your family’s “together time” in your new kitchen! Thanks for the encouraging words, and just let me know when you want me on ITK, and I’ll be there. It was so much fun! I agree! MamaSteph needs to be back on I. T. K. !!! She is so fun to watch and she really makes it easy. Nothing is too complicated and everything she bakes, or cooks, tastes amazing!!! decisions, decisions I would love to try either supper Cinnamon-y Snicker-doodles. I have yet to find ones I REALLY like or the mint chocolate chip because mint is the BEST! Oh, I would love some ginger cookies! Yum! Yes, Joe should have you back on “In The Kitchen”!!!!! 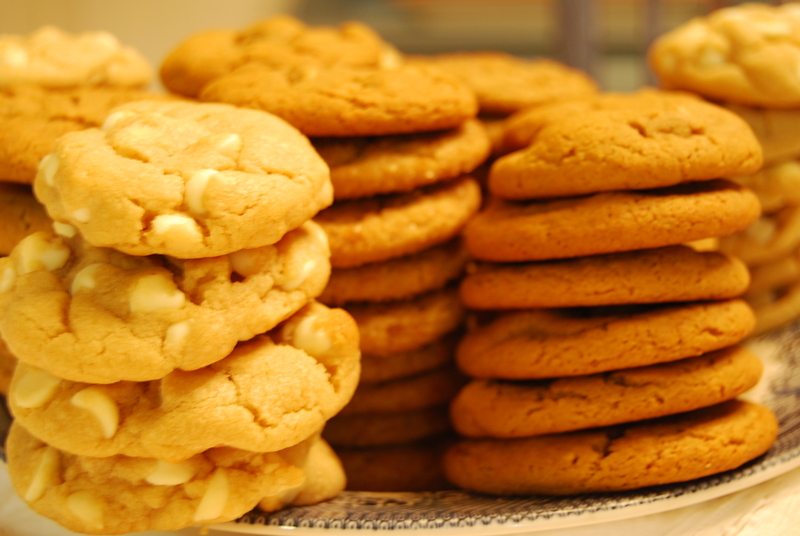 I would like either the lemon or snickerdoodles…Happy Natioal Homemade Cookie Day, “Cookie Lady”!!! I haven’t had them yet but I would just bet my favorite between the two would be Super Cinnamony Snickerdoodle! Isn’t Fall the best! I’m subscribed via RSS feed, does that count? I’d love to try the Snickerdoodles. Never had Ginger cookies.. sounds yummy!! Now what starts with the letter “C”? Let’s think of other things that starts with “C”! Uh. . .Uh. . . Who cares about da other things?! Oh! cookie, cookie, cookie starts with “C”! So glad to have found your blog via FB. I don’t have a favorite cookie yet, but the Snickerdoodles sound REALLY yummy! I LOVE cookies… everyone calls me their Cookie Monster! GINGER!! The best cookies in the WORLD! And the bLoG is fun to read! Stephanie, after finally trying one of your FAMOUS ginger cookies last night at Brenda’s memorial service, I’m going to have to buy some. Unfortunately (or maybe more like Fortunately for ME! ), my guys didn’t like them. Not big on ginger, but that’s fine, more for me!!!!! PS. Like I need cookies, but they are comforting, esp. with a cup of coffee! Well, if Joe Terrell gets in on this….I have to. Mint Chocolate-Chip cookies are a very close second to your Cherry-Chocolate Chip Cookies….I vote them a tie really. So Good….Bring it on MamaSteph…Bring it on!!! I haven’t tried your cookies yet but would love to have some ginger ones! How about an assortment … 4 each! 4 lemon, 4 ginger, and 4 molasses : -) I’m not too difficult am I? Oh, I gotta try your chewy ginger cookies and dip them in that scrumptious Pumpkin Dip….with an apple slice or two as well!!! Our winner was Clarissa Ochoa! 🙂 Congratulations, Clarissa! Wow, that sounds delectable, Rita! Great idea! Opps, just reread it! The Super Cinnamon-y Snickerdoodles sound so yummy!